B-a-a-a-a! Your castle is infested with sheep and you cannot sleep. 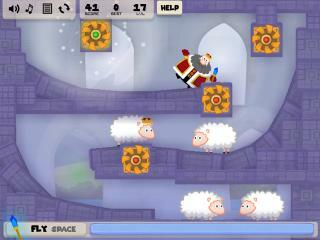 Use your flying and rolling skills to give the woolly invaders their marching orders. Your castle is infested with sheep! Knock out all of the woolly invaders, while taking care to avoid the comfy cushions that could send you to sleep. Use your flying and rolling skills to complete each level. Suitable for ages six and upwards. Wait for the game to load. When the blue line reaches the end of the screen, press "Continue" to begin playing. I'm a 57 year old woman looking to meet men between the ages of 52 and 75.